Ashampoo Driver Updater 1.1.0 Free Download Latest Version For Windows Os (XP-7-8-10). Get the standalone offline installer setup file of Ashampoo Driver Updater with a single, direct and secure download link. The downloaded setup file is compatible with both Windows 32 and 64-bit versions. Wrong or old drivers are the enemies of every computer system. Often the drivers are missing or hopelessly outdated. Ashampoo Driver Updater not only finds the best drivers but also install them for you. Ashampoo Driver Updater provides updates for a wide variety of components and devices from lesser known to professional brands. As soon as the new drivers become available, they are immediately added to the huge Ashampoo Updater Driver database and thus become available to you. 1. Great performance with updated drivers! More than 400,000 drivers available. More than 150,000 devices supported. Maximum system stability. Verify - install - ready. There is no need for complicated menus with Ashampoo Driver Updater. It's well-designed program performs its job of keeping your computer up to date quickly and with a high degree of usability. It analyzes the hardware components and drivers, compares the results with a gigantic database - and then replaces outdated drivers with their latest versions. 2. Always by your side. You decide when Ashampoo Driver Updater will take action. The built-in planner gives you reliable control over when the program will scan your system for updates. Once set up, you do not have to be thinking about it and your system will stay up to date, always! 3. Problems? There is a solution! Faults, sound problems, graphic problems, or poor performance are often the result of wrong, corrupt or outdated drivers. After the transition to Windows 10, many systems are working "somehow," but not optimally. Let Ashampoo Driver Updater fix what Windows itself has fixed for you! Drivers are constantly being developed and updated to avoid crashes and be compatible with the maximum of installed hardware components. Especially games that benefit from a high performance system. Current graphics drivers can give you an extra boost when you need it. 5. Security to the maximum. You will not take any risk with Ashampoo Driver Updater. Its built-in backup feature allows you to save and restore any driver if needed. It keeps only what really brings benefits to you! 6. The good feeling when everything works. Even without visible glitches, your system components may not be working optimally. WLAN outages, loud noise, or disconnected printers are frequent issues. They are often standard Windows drivers that do not provide optimal functionality and leave no room for other drivers. The transition to Windows 10 meant a lot of trouble for many users. Are hardware components installed and still not supported, and where can appropriate drivers be obtained? 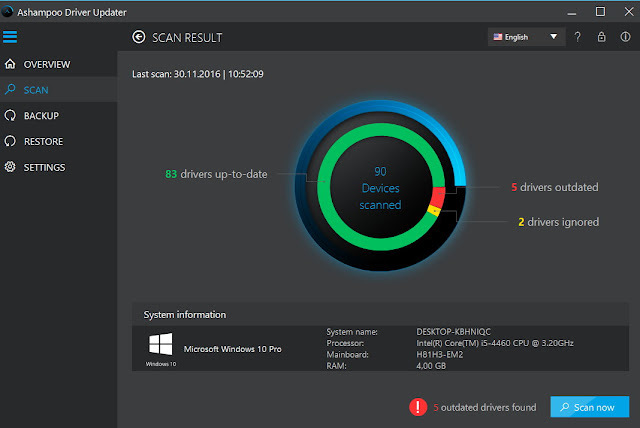 Ashampoo Driver Updater does the hard work and instantly finds all the available Windows 10 drivers for you. Software Name: Ashampoo Driver Updater Free Download. Click on the button below in order to download the standalone offline setup file of Ashampoo Driver Updater for PC both 32-bit and 64-bit OS.